Promising Ni, Cu and PGE discovery in northern Norway. Nordic Mining’s exploration in the Seiland Igneous Province in Northern Norway has led to the discovery of new magmatic Nickel (Ni), Copper (Cu), Cobalt (Co) and Platinum (Pd), Palladium (Pt) and Gold (Au) mineralizations in the Reinfjord area on the Øksfjord Peninsula. Hauling of drilling equipment in Reinfjord. The Øksfjord Peninsula is part of “The Seiland Igneous Province” (SIP) known for its 5,500 km2 of mafic and ultramafic intrusions (75% by area) that were emplaced 560-570 million years ago. The remaining 25 % of SIP consists of calc-alkaline and alkaline igneous plutons. The complex shares many characteristics with classical PGE-Cu-Ni regions such as the famous Bushveld Complex in South Africa, Stillwater in Montana and Fennoscandian Suhanko and Penikat intrusions in Finland. It has been suggested that SIP represents deep seated parts of a large magmatic pluming system, that, on the surface, may have fed massive volcanic outpouring systems comparable to for example the Siberian Trap and the North Atlantic Volcanic Province (Larsen et al. 2012). SIP is to a large extent unexplored for high-end minerals though erratic base metal findings have been reported in early exploration reports from the 1970’s. 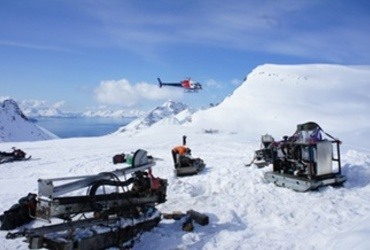 Nordic Mining has carried out fieldwork and sampling in several areas of interest within the complex (Often and Schiellerup 2008, Iljina 2011). 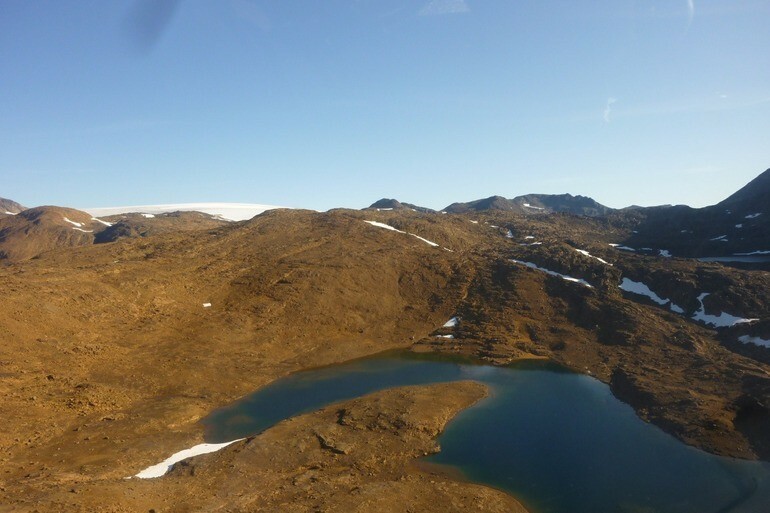 Airborne geophysical survey (Electromagnetic and Magnetic measurements) was carried out by SkyTem in the two most promising targets, The Reinfjord and Lokkarfjord Intrusions, in July 2011. 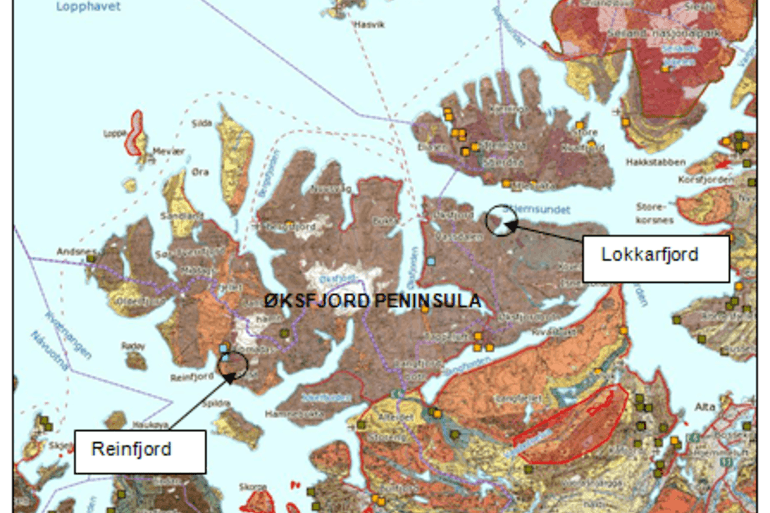 An expert review of the geophysical data by Revelation Geosciences revealed two conductive bodies side by side in the Reinfjord Intrusion, and four targets within the Lokkarfjord intrusion (Johnson 2011). Nordic Mining prioritised the Reinfjord Intrusion for further investigations and a ground electromagnetic survey (TEM) was completed in early 2012. 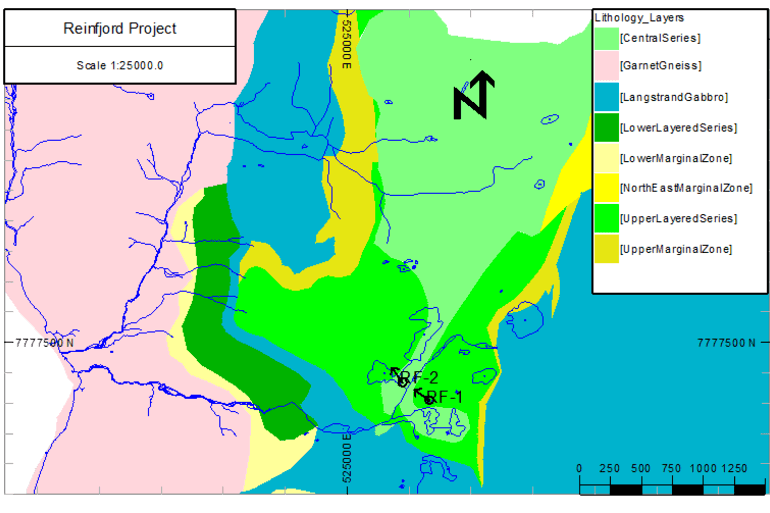 The result of the survey carried out by Geovista AB confirmed a sizeable conductor in Reinfjord at approximate depth of 100 meters (Thunehed 2012). Exploration drilling was then carried out in May 2012. This drillinglead to the discovery of Ni, Cu, Co, PGE and gold (Au) enriched sulphide mineralizations between 86 and 116 meters fitting well with the interpreted conductors. Modeling of the ground geophysical data (TEM) shows a large conductive field (600 x 600 meters) within the Reinfjord Intrusion. The conductor is located between the depths 60 and 110 from the surface, and is open towards the northeast (Fig. 3). The conductor is shaped like a flat lying, open bowl dipping gently towards the northeast. Figure 3 is a 3D interpretation of the conductor (Thunehed 2012). 3D model of Reinfjord conductor. 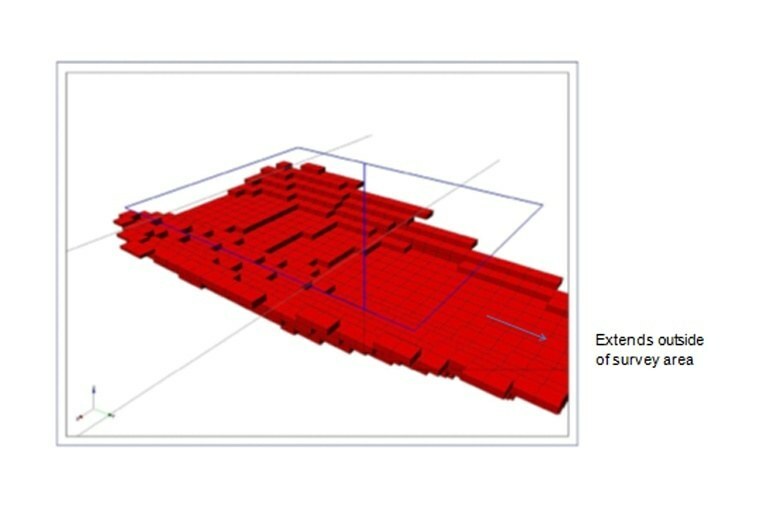 Each cell has an estimated resistivity of 5 ohm. The conductor is open towards the northeast. 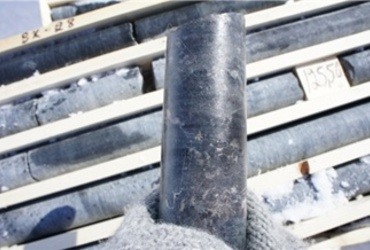 In May 2012 Nordic Mining conducted a drilling program of two holes to 243 and 169 meters in depth respectively. Drill hole RF-1 intersected two zones of disseminated sulphides. A Ni/Cu rich zone (between 86 and 93 meters) underlain by a more PGE+Au enriched zone (between 107 and 117 meters). The PGE zone was characterized by pegmatitic texture with coarse grained pyroxene, blue quartz and plagioclase (for results from drilling se report by Iljina 2012). 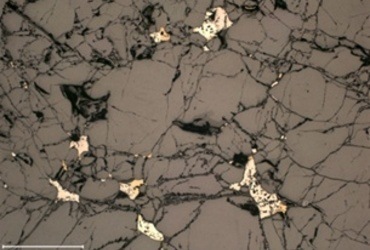 Microscope observations show that interstices of ore forming pentlandite and chalcopyrite are present in drill hole RF-1, see figure 4 below. Cubanite and native copper are alteration products of chalcopyrite. The Reinfjord Intrusion is situated in the Kvænangen municipality in Troms County. The target area is located at an altitude of approximately 600 meters above the sea level about 2.5 km from the coastline and village of Reinfjord. Figure 6 shows the geology of the Reinfjord Intrusion. The ultramafic intrusion is bordered by gabbro in the east and garnet gneiss in the west. 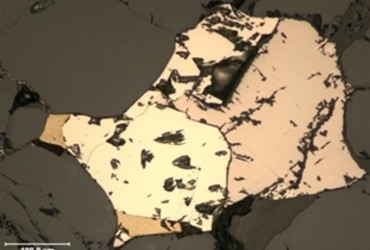 The intrusion consists of layered olivine-pyroxenites and wherlite/dunites (The Layered Series) and a slightly younger dunite (The Central Series). There are evidences of partial melting and assimilation of wallrock along the intrusion in The Marginal Series. Uneconomic disseminated Ni/Cu mineralizations depleted in PGE-Au are found in several places exposed along the Marginal Series. These seem to be “Contact type” mineralizations formed by country rock contamination and are known as the Småvatna and Bonjikdalen mineralizations (Iljina 2011, 2012). Map showing geological units of the Reinfjord Intrusion. Drill hole locations are marked with arrows. Field observations show evidences of magma replenishment and geochemical studies of drill cores indicate magma injections of variable compositions. The presence of evolved or contaminated magma and/or fluids has resulted in pegmatitic textures and formation of felsic minerals. Overview of the upper part of the Reinfjord intrusion. Drill hole RF-1 is located close to the lower right corner of the photo. The Langfjordjøkelen glacier is seen in the far distance. The next phase of exploration for the Reinfjord Intrusion would be to conduct a larger drilling campaign. The aim is to further investigate the EM anomaly and the discovered mineralization. Nordic Mining will put effort into understanding the relationship between the geological setting, the mineralized intervals and the modelled conductor.